Recommendations in respect of some important allowances paid to Nurses & Ministerial Staffs of Hospital i. 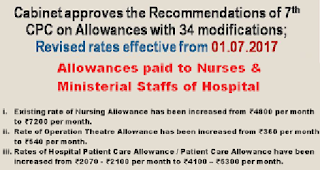 Existing rate of Nursing Allowance has been increased from ₹4800 per month to ₹7200 per month. ii. Rate of Operation Theatre Allowance has been increased from ₹360 per month to ₹540 per month.